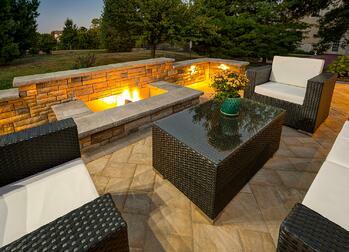 Fire pits and outdoor fireplaces are an incredibly useful addition to your outdoor living area. That’s because they add both light and heat to your outdoor space. 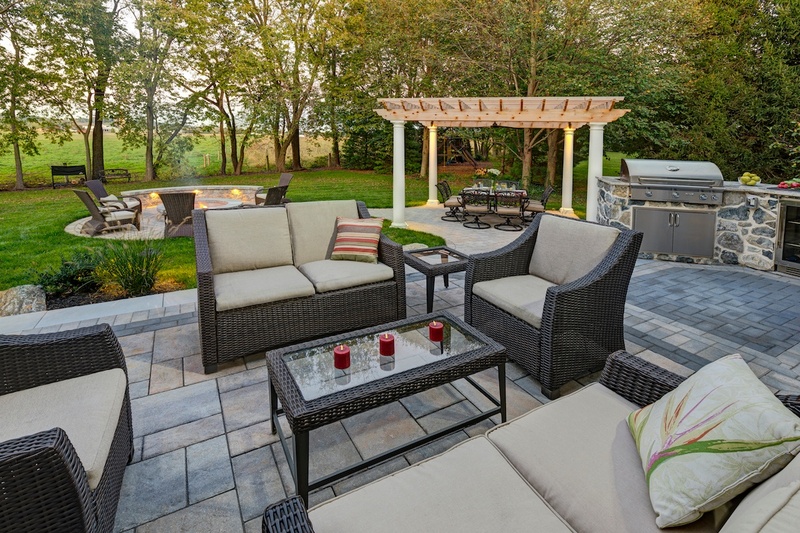 Plus, because everyone is drawn to fire, adding a fire pit or outdoor fireplace also helps transform your space into a gathering place, enhancing everyone’s overall enjoyment. When it comes to outdoor fireplace ideas and fire pit designs, there are so many directions you can go. 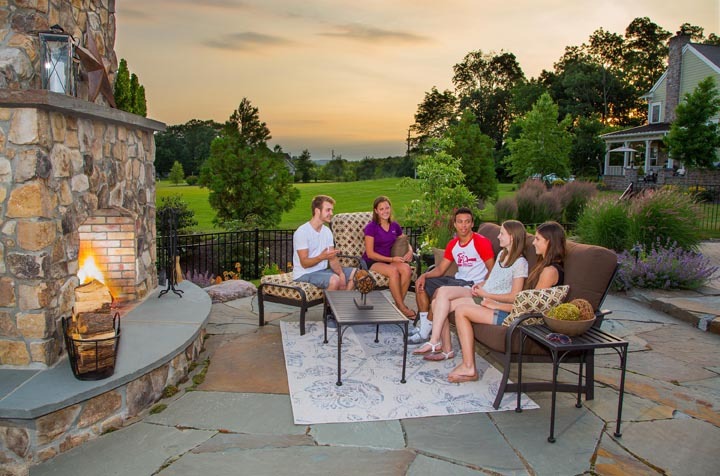 From size, to material and even storage capabilities for the wood, there are a multitude of design decisions to be made, all of which will make the fire pit or outdoor fireplace truly your own. Because we know narrowing down the possibilities might feel a bit overwhelming, we’ve rounded up some of the hottest outdoor fireplace pictures from our portfolio of work to help get the ideas burning. The orientation is where the outdoor fireplace design really counts. 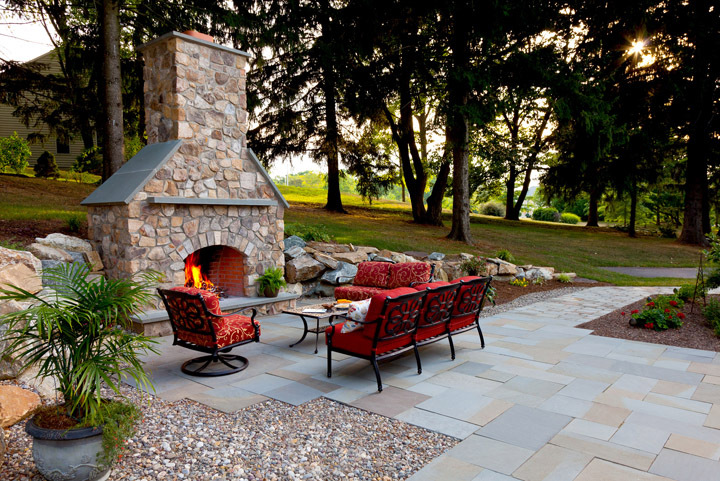 An outdoor fireplace cannot just be plunked anywhere in the yard. Attention must be given to its placement. This particular outdoor fireplace can be seen from strategic areas of the property, including a bench seat in the nearby pool. That means the family can be right by the kids while they swim while also still getting a straight shot view of the gorgeous roaring fire--and its mounted television. 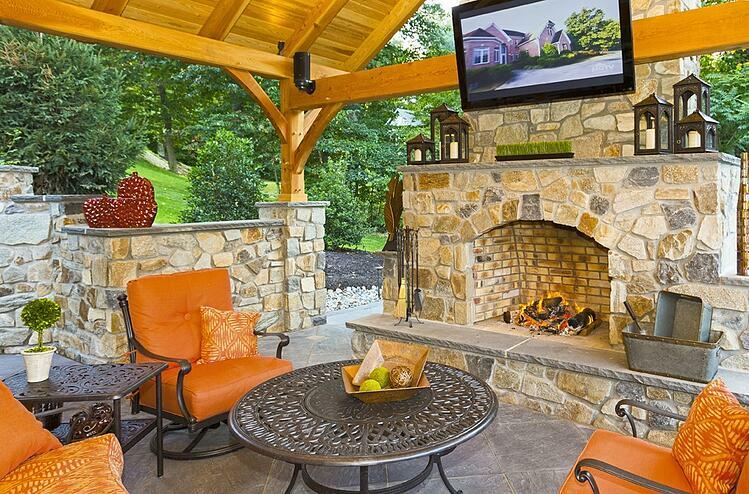 If you’re going to invest in a beautiful outdoor fireplace, you surely want to enjoy it as often as possible! The decorative possibilities run wild with both the mantle and hearth space available in your design. In this particular case, the hearth also provides functional space to keep the tools needed for this rustic wood-burning outdoor fireplace. This is also a great example of the fact that a television does not have to be mounted to the chimney. Instead, it can also be mounted to a beam, as it is in this pavilion. In this particular example, the chimney is not a structural part of the pavilion as in other designs. This is a great example of how important it is for an outdoor fireplace design to take into account the rest of the property. That’s because every single element makes a difference in the overall look and feel of your space. In this case, the chimney complements the brick that is on the main home. Taking design features from your home into account ensures that a new feature on your property doesn’t look completely foreign. It’s important that is blends with its surroundings as though it was always there. Because of the attention given to this chimney, the pavilion makes a seamless blend into the existing landscape. The beautiful curved hearth of this fireplace draws you in. For this client, like so many others, they had their kids in mind in their goal of creating a “hang-out spot” by their fireplace area. By creating a destination in your backyard, you’re creating a space where your kids, even as they get older, want to be. In this particular outdoor fireplace design, there was also a wood storage cove created in the back so that wood could be stored out of sight. Any structure can also be used to help create some privacy. In this outdoor fireplace image, you can see how the fireplace itself helps in terms of privacy screening from the neighbors. On this property, where houses are close to one another and space is at a premium, a cozy fireplace blocks some of the view into the neighbor’s yard while creating a comfortable seating area off of the outdoor kitchen. With a good design, you can maximize even a smaller space to its full potential. 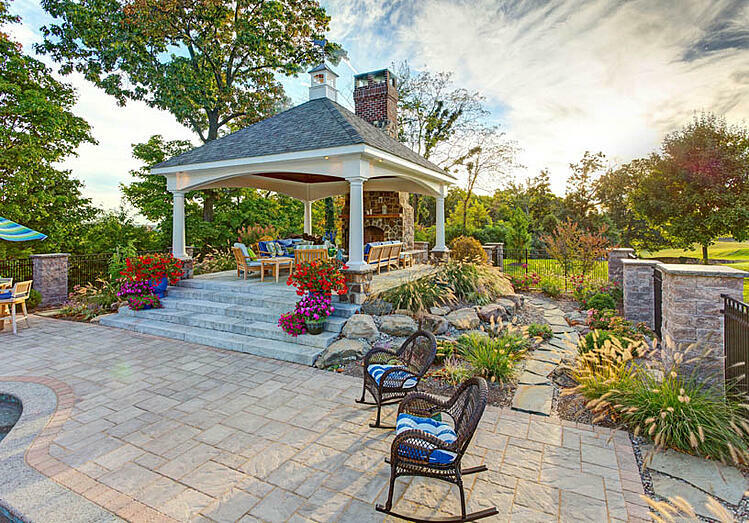 While a lot of our outdoor fireplaces and fire pits are built within pavilions, a freestanding outdoor fireplace is also a beautiful addition to your space. Because there is no mounted television dictating any dimensions, the chimney can be narrower in a design like this. This seating area also ties in a lot of natural elements with the boulder rock wall flanking the fireplace. A small storage area was built into the side of this structure to store the wood. This is another great example of a design that works with the specific area to customize a finished product. Because this is a long and narrow lot, the space was somewhat limited. The curved walls not only create some unique seating areas but also add some aesthetic appeal in an area that was spatially limited. Like all of our fire pit designs, this one includes a stainless steel liner to help dissipate heat. That is a custom element that is part of all our designs and not something you would get with a store-bought fire pit. This combination of a concentric retaining wall with seating built in provides more than enough space for people to sit. 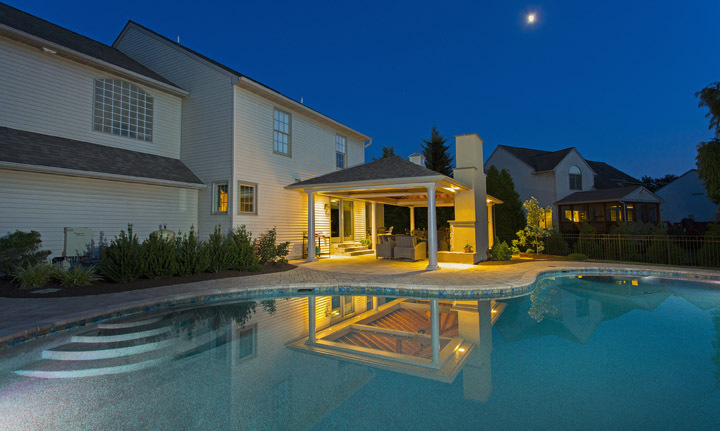 Imagine gathering around the fire pit to roast marshmallows, share stories, or simply cozy up with your family and friends. With ample seating space, everyone can have a comfortable place to sit by the fire. 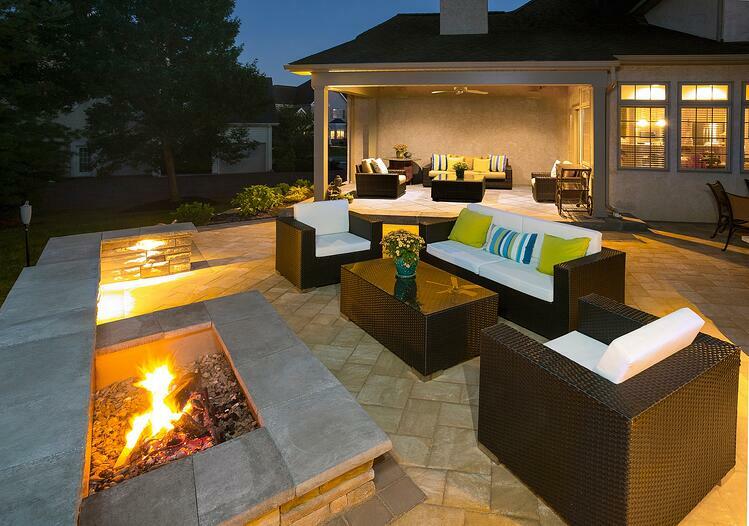 Make sure that your outdoor fireplace or fire pit design takes plenty of nearby seating into account. This seating wall is pulled into a curve that is just a tad over 180 degrees in order to provide ample seating space and a cozy little nook for family and guests. The lights built into the wall provide added functionality in getting around the space at night. While not pictured here, this client (like many) added beautiful and comfy cushions to the area that not only add to the comfort level but create a colorful visual during the day. 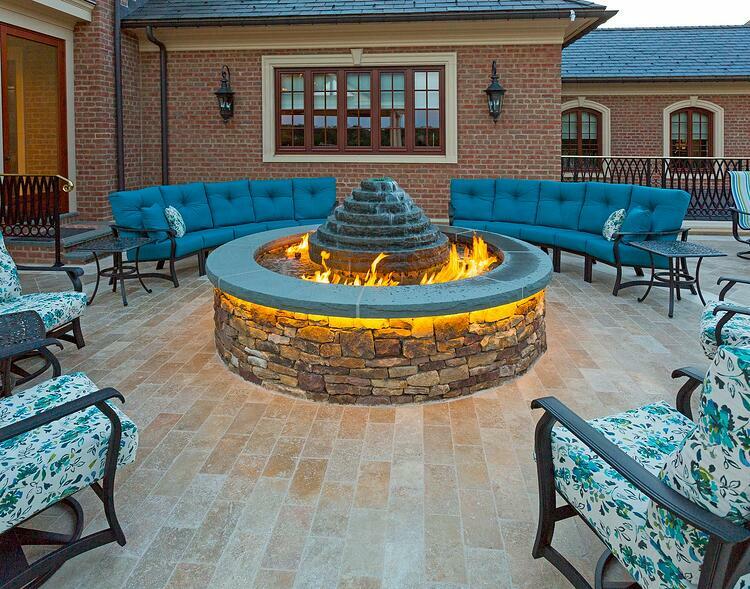 There’s no rule saying that your fire pit has to be circular! 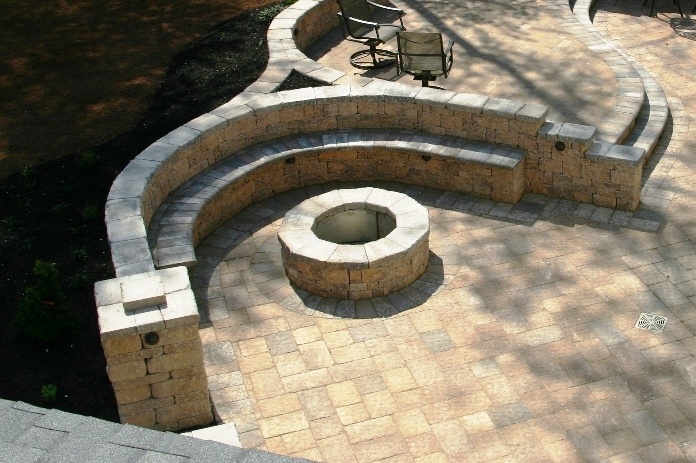 A square fire pit is unique and even a bit more modern in its appearance. 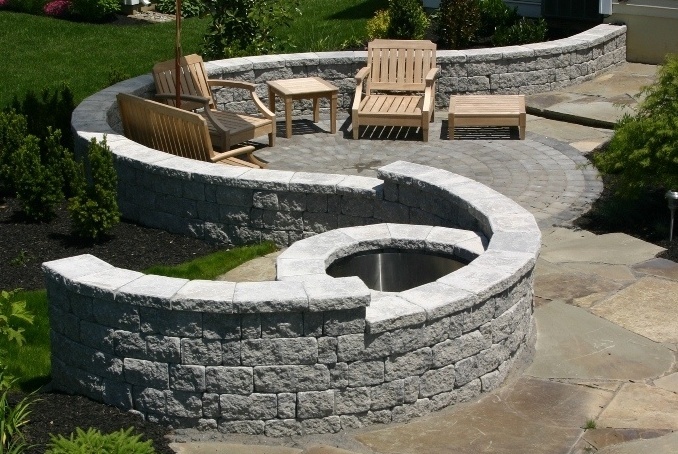 In this case, the square fire pit was incorporated into a modular wall built at various heights. It creates a lot of visual appeal while also providing plenty of space for family and guests to gather around and enjoy the comfort and warmth of the fire. Who says your fire pit need only have fire? In this unique fire-and-water feature, it almost appears as though the water itself is on fire. It creates an incredibly unusual showpiece that is truly one-of-a-kind. Don’t be afraid to think outside of the box. Combining fire and water was the client’s idea in this case! We always encourage our clients to dream big and work with their ideas. 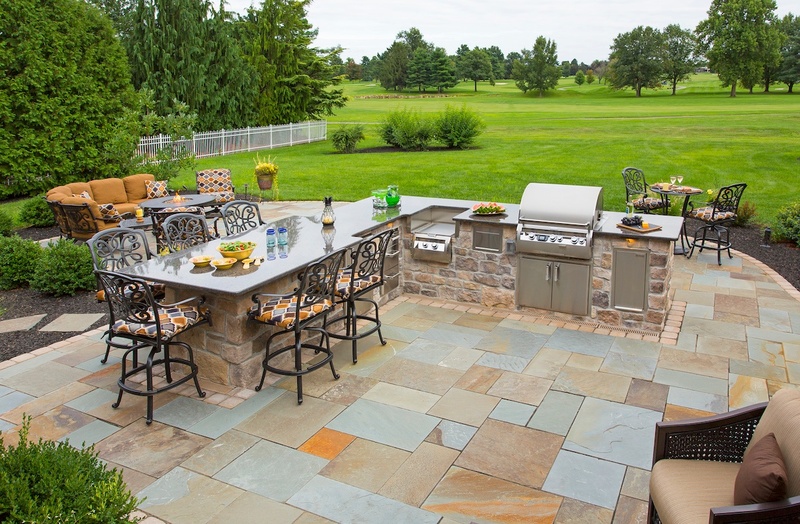 If you thought that adding a firepit or outdoor fireplace was simple, you might feel a bit differently now. Sure, anyone could build an outdoor fireplace from a prefabricated kit or plunk a cheap fire pit in your yard. 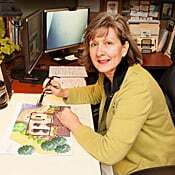 But a custom design and a high quality end result takes much more forethought. The possibilities are truly endless in terms of what you can create with a good outdoor fireplace design. But good design are the key words. Without the help of a Registered Landscape Architect (RLA), your project may not take into account all of those little details that really do make a difference. From exactly where to build it to what materials will help it best complement the surrounding property, it’s those small details that can count the most in the end. 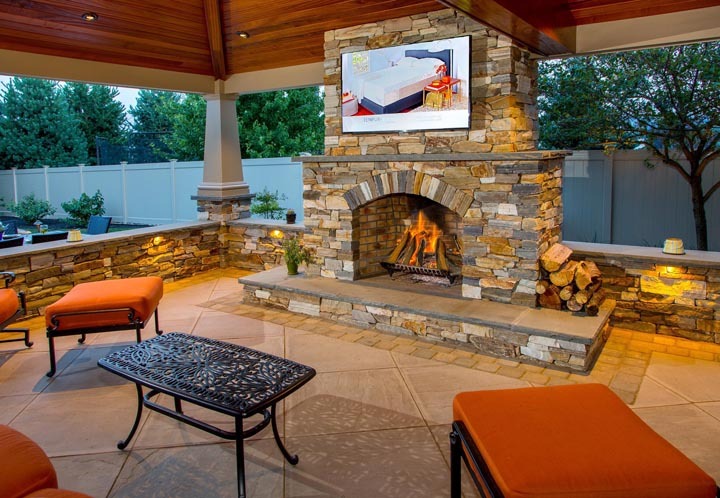 With the help of a RLA, you’ll feel comfortable walking through all of the outdoor fireplace ideas from choosing the best material, to wood versus gas, or even other design considerations such as the size of the mantle, whether to mount a television, and adding storage. 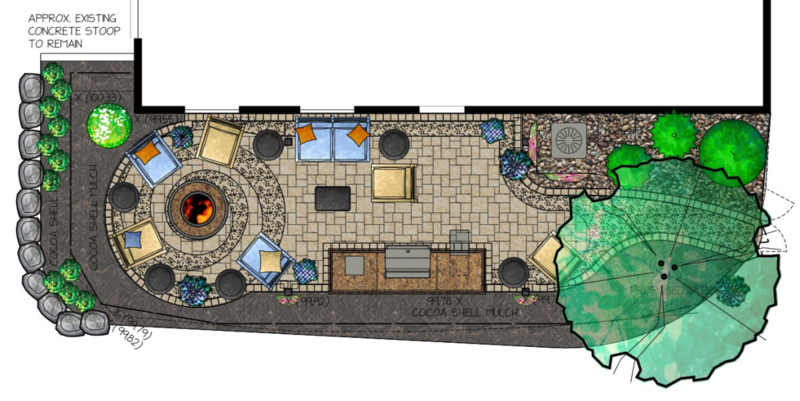 Every single decision matters and is one step closer toward the fire pit or outdoor fireplace truly being your own. Earth, Turf & Wood can help you through every stage of the process. From the design phase to its completion, we will ensure that your fire pit or outdoor fireplace is exactly what you’ve been dreaming of. 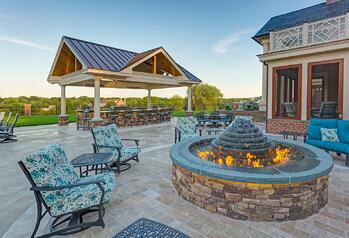 We have created hundreds of custom outdoor fireplaces and fire pits for our clients over the years. 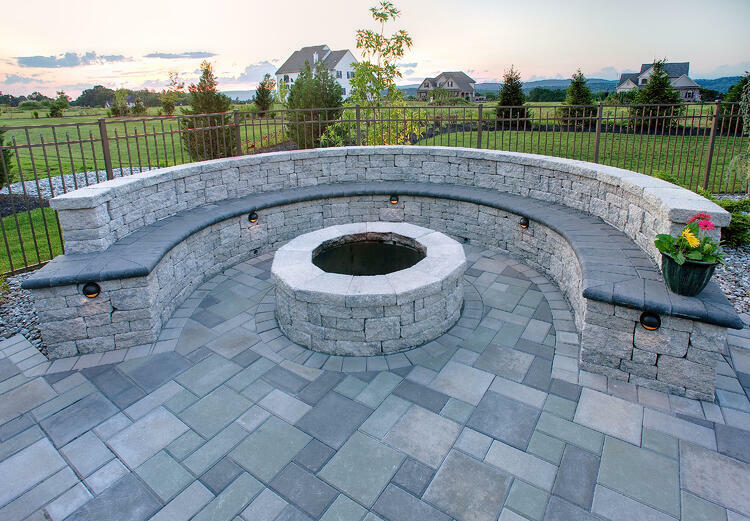 Whether it’s a small project or something much larger, we can help you bring your outdoor fireplace and fire pit ideas to life. 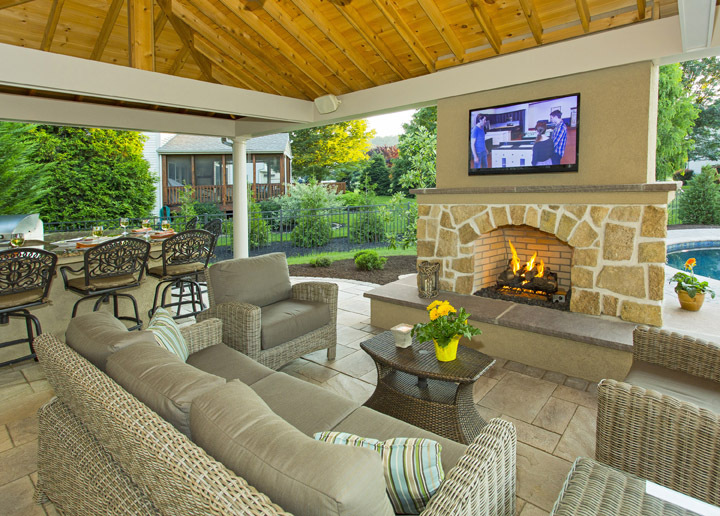 If you would like to see more outdoor fireplace pictures, visit our idea gallery. Or, if you’re ready to start talking about your ideas, give us a call at (717) 276-9447 or schedule a free consultation.